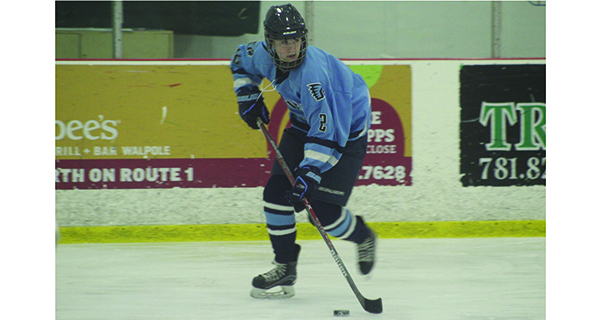 Coming off a 6-3 victory at Framingham on Friday afternoon, the Medfield/Norton High girls varsity hockey team returned home to Rodman Arena on Saturday night to open up TVL play against rival Westwood. Like the Warriors (1-2-0, 0-1-0) the Lady-Wolverines (2-0-0, 1-0-0) also entered Saturday’s tilt coming off a victory after taking down South Shore power Hingham (2-1) in their season opener on December 8. Behind a pair of goals by senior captain and forward Kat Keith, as well as a 14-save shutout by senior captain and goalie Caroline McDonough, Westwood outlasted the Mia Prego-led Warriors by a 3-0 final to win their second straight game to begin the 2018-2019 season. Emma Conway got the Wolverines on the board first at 11:07 of the opening period when the junior winger put home a rebound on a net-mouth to seize the early 1-0 lead. Lauren Sleboda nearly evened the game at one for Medfield on a two-on-one bid just moments later, but the senior captain was turned away by the left pad of McDonough. The game remained 1-0 in favor of Westwood after one period.
. The tally doubled Westwood’s lead to 2-0 at the second intermission. With seven minutes to play in the game, Keith delivered the dagger, hammering home a power play goal for her third point of the contest (two goals, one assist) to make it a three-goal game. The Wolverines preserved the shutout for McDonough and emerged with the 3-0 victory. Westwood returns to action against Needham on December 22 while Medfield will look to get back on track against Canton on December 27.